How do you serve ratatouille? Is ratatouille a side dish? Is ratatouille a main dish? What is ratatouille, anyway? The answers to all your ratatouille questions are right here—including five best ways to serve ratatouille. Read on! I love using my braiser for Ratatouille. What? You don’t know what a braiser is? Read my post to help you to decide if this is a must-have for you or not. 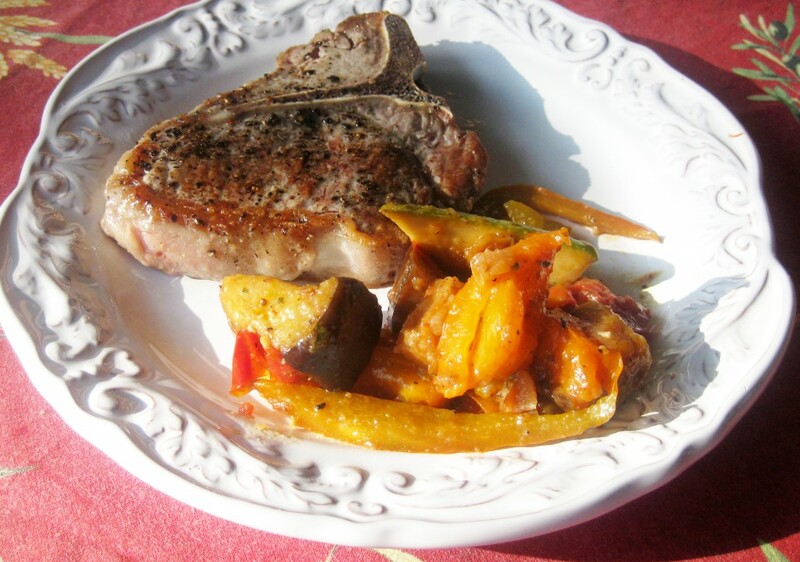 Veal Chop with Ratatouille. 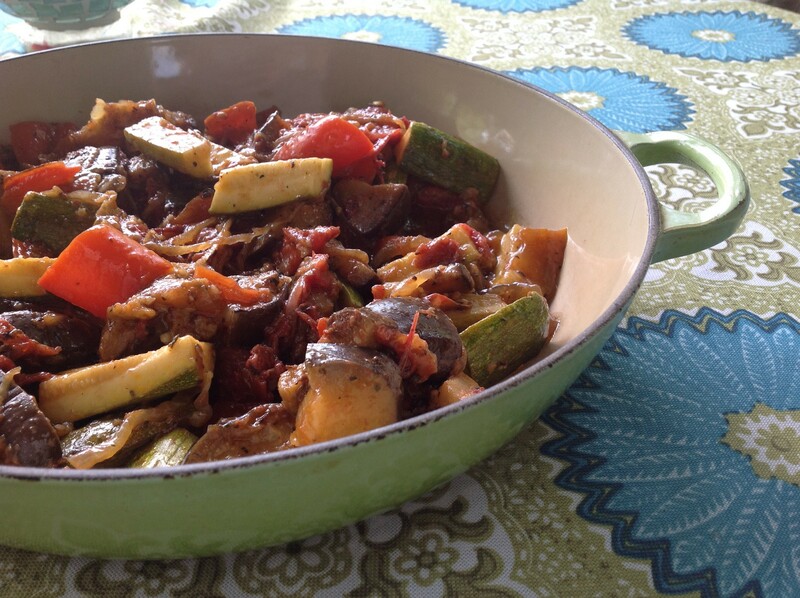 Ratatouille goes well with all kinds of grilled meats—love it with flank steak, lamb, and veal, especially. 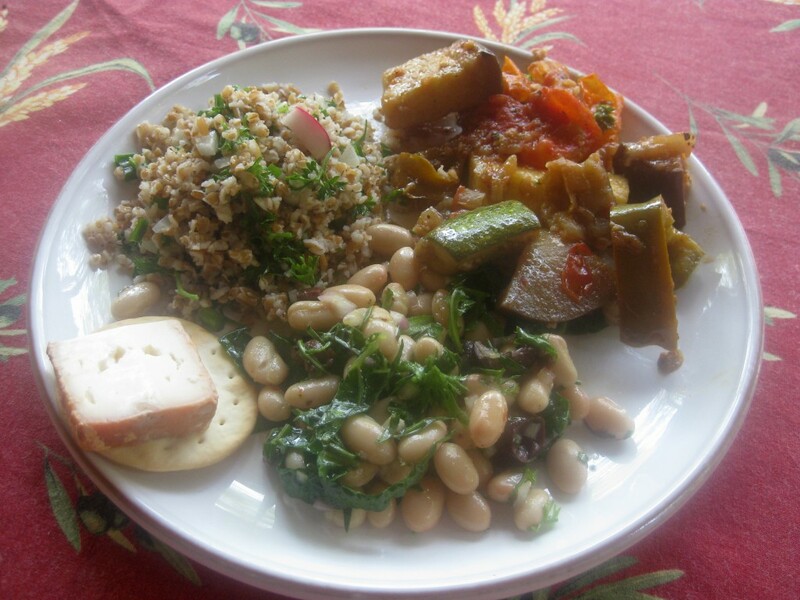 From upper right: Ratatouille, White Bean-Tarragon Salad (page 52 of the Bonne Femme Cookbook), and Tabbouleh. Plus a little cracker of a local washed-rind sheeps-milk cheese. Gorgeous lunch on a hot day. 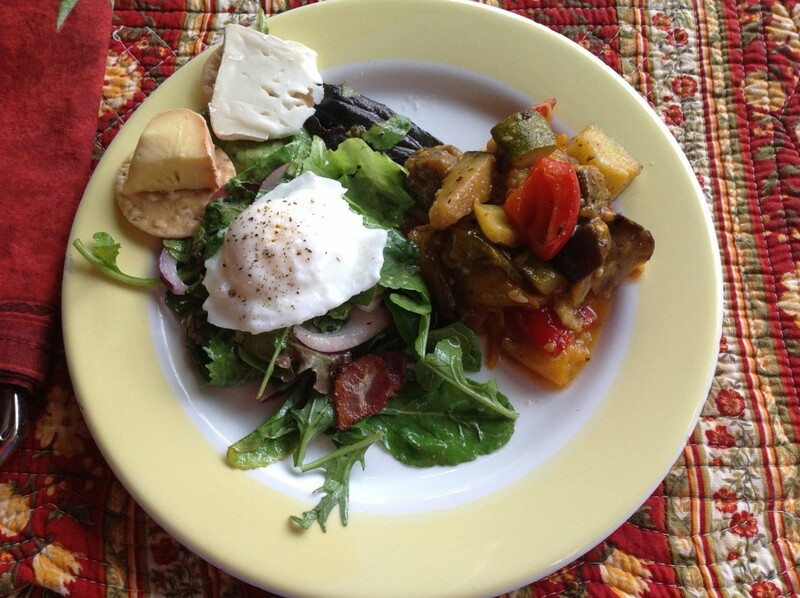 J’adore poached egg salads, and ratatouille is a super summer go-along. Just add a few cheese-topped crackers for a satisfying, flavor-charged meal. Serve with a risotto or (even easier), my Rice Cremeux (page 240 of The Bonne Femme Cookbook) for a great vegetarian main dish. 1. 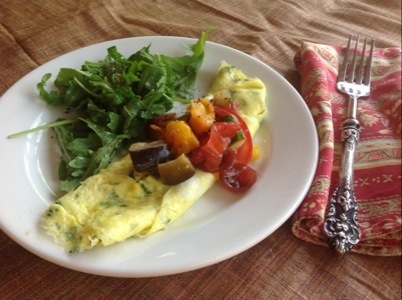 Find a great recipe (mine is here). 2. Use only the best, freshest ingredients you can find. Don’t even bother to make ratatouille if you can’t find great in-season veggies. 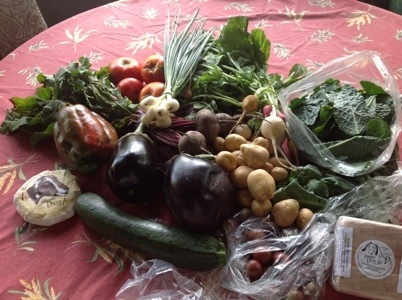 Pictured above is a great farmers market haul. 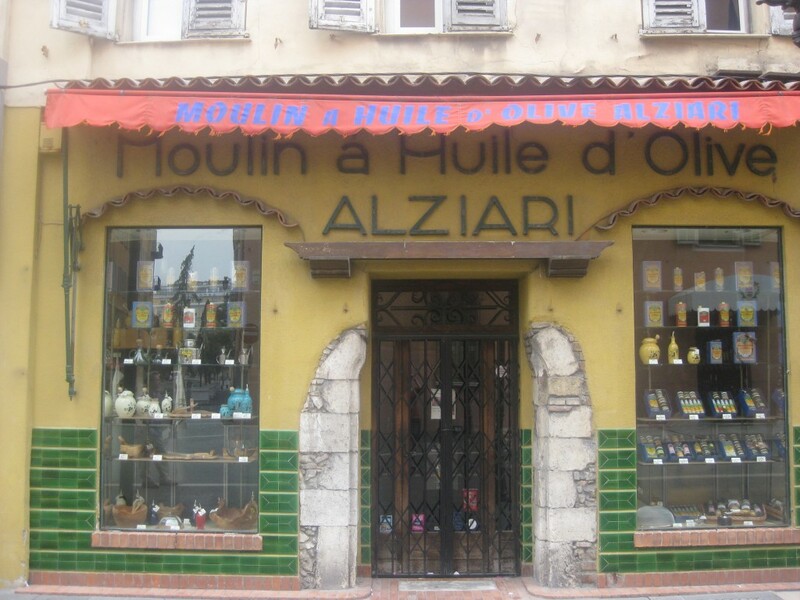 I got olive oil from Nicolas Alziari in Nice. It’s available at Williams-Sonoma, but you don’t need to use that particular oil. Just use the best one you have. It will make a difference in this dish. 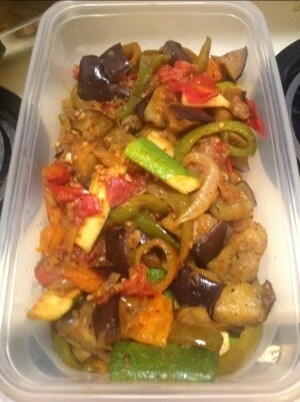 After you’ve made the ratatouille, refrigerate it for a day. Those flavors will really take off after some time together. I serve it with seasoned lentils and whole grain bread. It wouldn’t work as a vegetarian main course because there is no protein in it. 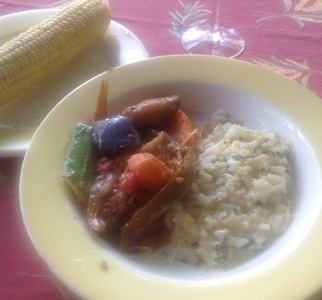 I followed recommendation #2 last night– “Array of Summery Salads”– with Alice Waters’ ratatouille and the tarragon bean salad along with my own mushroom brown rice dish and a green salad. Cheese, fruit, absinthe, and a few French wines made for a delicious Bastille Day dinner with friends.